Many are lauding the hiring of 51-year old Delrish Moss, a 32-year veteran of the Miami, Florida police department, as the new police chief in Ferguson, Missouri. The same one that in the summer of 2014, exploded into riotous violence after the controversial shooting death of unarmed black teenager Michael Brown by former Ferguson police officer Darren Wilson. As the city’s new police chief, Delrish Moss has committed to a more diverse Ferguson police department. This will undoubtedly come as welcome news to a city that is more than 67 percent black, but in which only three of its 53 police officers (slightly more than 1/2 of one percent) are black. It is not my goal in this blog post to address the root cause(s) of why such a disparity exists (though I do have my opinions). Conversely, I would caution against drawing any conclusions based on those numbers alone. That said, suffice it to say that Delrish Moss comes across as a strong advocate of “community policing”, a concept which, among other principles, espouses the idea that police departments should reflect the racial, ethnic, and gender diversity of the communities they serve. Needless to say, community policing is not a doctrine currently practiced in Ferguson, which is a primary reason why Moss was chosen for the job from among more than 50 other candidates. To a great degree, the racial animosity many residents of Ferguson felt two years ago toward the police department remains unsettled still today. This despite the fact that positive changes have occurred since then. Nonetheless, to whatever extent a community policing model might actually lend itself to assuaging such enmity, it is at best only a stop-gap solution to what is an age-old problem, one that existed long before the founding of the city of Ferguson more than 120 years ago. With all due respect to Delrish Moss, and the many who no doubt deem it an admirable endeavor to bring more diversity to the Ferguson police force, I fail to understand why such change is necessary as a matter of policy. Is this to suggest that minorities in Ferguson are more inclined to submit to the authority of a police officer only when and if that officer is of the same race or ethnicity as they? As a black man, why should the impetus for my compliance or non-compliance with law enforcement be influenced by whether or not the officer with whom I am interacting is also black? I set out to write this piece fully aware of the risks of being completely misunderstood for what I would express on this subject. I was not at all blind to that possibility. So, to the extent that it might help prevent or avoid any confusion, I offer the following as an apologetic (of sorts). I am neither ignorant of nor indifferent to the controversial circumstances surrounding not only the death of Michael Brown at the hands of police in Ferguson, but also the equally high-profile cases of Freddie Gray in Baltimore, Tamir Rice in Cleveland, and Eric Garner in New York. Conversely, I am not unmindful of how these and similar incidents have factored into the rise of present-day social justice movements such as Black Lives Matter. So, don’t be so quick to rescind my “blackness card” just yet, okay? None of what I have opined in this post was written in a vacuum. I totally grasp the fact that such episodes as the aforementioned were not the first of their kind in America nor will they be the last. Nevertheless, the question that I, Darrell B. Harrison, must consider in light of such events is: how should I live? It is a new take on the old “the chicken or the egg” proposition of which comes first: my identity as a Christian or my identity as a black man? This is an extremely weighty question. So much so that it touches on every aspect of how I, as one who professes to be a follower of Jesus Christ, am called to live in this world. Probably the most challenging thing about living the Christian life is dying to self. And yet it is this self-mortification that is at the very heart of what it means to be a follower of Jesus (Luke 9:23). The problem many of us Christians have with the gospel is that it actually presents us with opportunities to live out in practice what we say to believe (e.g. marriage, parenting, etc.) We may profess to having an appreciation that death to self is foundational to our witness for Christ. But, if we were honest, we would have to admit that it is this same obligation we most often desire to circumvent, especially when someone offends us (1 Peter 3:8-12). When it comes to people in positions of power who abuse their authority, what we want in those situations is a gospel with asterisks – Scriptural fine print that in “special circumstances” allows us to revert back to our unregenerate state and respond accordingly. But, you see, that’s not how the gospel works, at least not in the lives of those who truly have been reborn (John 3:3-5; 2 Corinthians 5:16-17). The gospel of Christ is a theology of crosses and nails not pillows and feathers (Matthew 16:24). To identify with Jesus is to die to everything we once were, to the complete renunciation of any rights or privileges associated with our former identity in this world (Ephesians 2:1-3; Galatians 2:20). 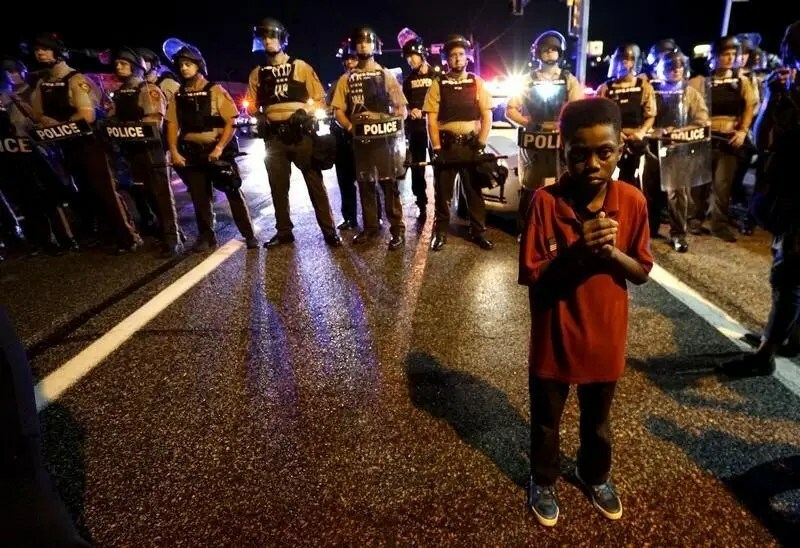 There are those in Ferguson who earnestly believe that a more racially diverse police force is what is needed to remedy the conflict that exists between themselves and the police. To make submitting to authority a matter of race or ethnicity is to make conditional our obedience to Christ. If I am to refer to Jesus as my Lord, then my allegiance to Him should be such that it should not matter to me how many black officers there are on the police force. What does a lack of diversity have to do with my volitional decision to obey or not obey the law? Again, I wish Delrish Moss all the best. He will be in my prayers as he takes over as the new police chief in Ferguson. However, I remain unconvinced that having a black police chief will in and of itself prove to be the elixir for what truly ails this beleaguered community. In the end, the citizen who breaks the law does so because of sin not because of his race. Likewise, the police officer who abuses the citizen who breaks the law (or not) does so not because of race but because of sin (Ezekiel 36:26-27; Mark 7:17-23). The gospel of Jesus Christ unarguably and unambiguously speaks to the social issues of our day (Isaiah 1:17; Zechariah 7:9-10; Proverbs 31:9; Jeremiah 22:3; Romans 12:15-18; Micah 6:8; Psalm 82:3; 1 John 3:17-18; Amos 5:11-15; Isaiah 58:6-12; Leviticus 19:15; James 1:27; Micah 6:11; Proverbs 22:22-23). And yet every social issue is either a direct or indirect result of a violation of a spiritual (biblical) principle. What we must understand is that what afflicts the city of Ferguson is the same thing that afflicts the entire world. Which, ultimately, points us not to Ferguson, Missouri, but to the Garden of Eden, and a problem that not even the very capable and competent Delrish Moss can fix. Interesting Mr. Harrison. Living in Atlanta metro, I notice that in the city proper, just a shade over 50% black if my memory serves, the Mayor is black, the police chief is black, the Fire Services chief is black, the DA is black, the city council is majority black, the community advocate is black, and my guess is the majority of the department heads are black. Yet, at no time have I heard the DOJ, OCR or any other governmental department calling for an investigation. Yet, were this the other way around, that would be the case in all considerations. We have swung the pendulum to the other side. I grew up in the era of the other direction, and something should have been done, yet nothing was. It seems that we are now in correction mode, and perhaps that is not that bad of an idea. One extreme is followed by another, and perhaps a balance will be reached. Ferguson is just a litmus strip as the things that have been going on there have been going on other places as well, but not the same result. Much milder protests and perhaps less of a reaction. But the time is here, and the change is upon us. Christians should obey all authorities. But when 2 black police officers come to my door when I complained about the riotous behavior of a Hispanic family, and of a force of heavily majority white police force in a heavily majority white county, I question the motivation. And I feel threatened because I feel outnumbered on a legitimate complaint. I see what blacks are complaining about in a different light. Like it or not, we tend to feel a bit more comfortable with police (guns, handcuffs, police dogs) of our own color.